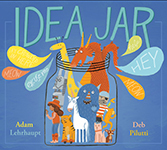 The idea jar is where students keep their ideas—anything from a Viking to a space robot to a giant dragon. These ideas can be combined to make new exciting stories. But watch out when the ideas escape the jar—they might get a little rowdy! 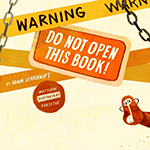 This picture book is sure to inspire creativity, imagination, and adventure. Create Your Own Idea Jar! Complete instructions to create your very own idea jar, plus an idea template and set of starter ideas. Where can you get Idea Jar?